When most people want a guitar, they head down to the local music store to pick one out. The novice looks for something inexpensive and sounds halfway decent. The more knowledgeable player may have already developed a preference for a particular style of guitar or brand name. Perhaps they want to upgrade to a better instrument. In general, the new guitar is acquired by way of cash, check, or credit card. Nick Blishen has his own way of getting a new guitar: He builds it. In Acoustic Guitar Making he shares the skills and insights he has gained from years of experience. The term “steel string guitar” in the title is there for a reason. When thinking of guitar construction, one’s mind may go to the beautiful, handcrafted classical guitars that use nylon strings (early classical guitars used gut strings similar to violin strings). But the bracing for a nylon string guitar is very different than that of a steel string guitar. The steel strings put much more tension on the instrument and reinforcement needs to be modified to deal with this extra strain. Since most players are right handed, they would naturally want a guitar that could be strung and played by a right handed individual (heavier strings at the “top” as you hold the guitar; if left handed, choices need to be made. One could learn to play right handed. The player could imitate Elizabeth Cotton (the folksinger who wrote “Freight Train”) and turn the guitar upside-down so the treble stings are at the top and the bass strings at the bottom. She developed an entirely new way of fingerpicking with this approach. Or one could design the guitar to be strung so a left handed player could string it in the normal fashion (tensions on bass strings are stronger than tensions on the lighter strings, so bracing needs to be changed for left-handed playing). Author Blishen discusses these and other practical issues of guitar construction throughout the book. Useful information is provided for construction of both left handed and right handed guitars. The book opens with a detailed description of the tools and materials needed to be successful when constructing a guitar. To equip a shop adequately will require some investment and many of the tools are specialized. He also covers in detail issues of wood, glues, and other components needed. One of the best features of this book is the photography. Mr. Blishen includes color pictures of every step in the construction process. The reader gets a clear idea of what is being done, the tools used, and the process to be carried out. As he describes the various steps, the author explains why guitar building is still a craft and not an “assembly line follow the dots” endeavor. He offers caution in many places, encouraging the budding guitar builder to experiment and take issues such as temperature and humidity into consideration. Mr. Blishen includes a refreshing section where he discusses “what went wrong.” He shows pictures and describes problems with construction, materials, and techniques. Some of the mistakes can be fixed, and he shows the reader how to do that. In other instances, his advice is to just back up and start all over again. 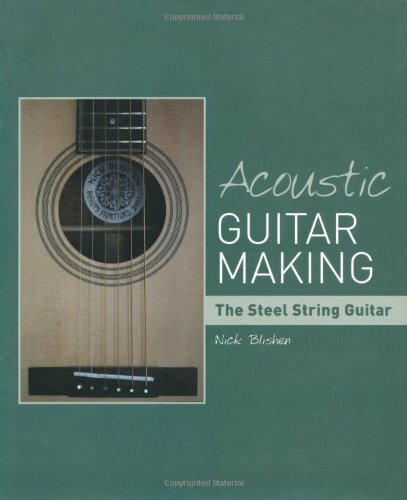 Acoustic Guitar Making is a joy to read and an essential part of the library of anyone who builds guitars or plays them. Don Calbreath bought his first guitar for $10.00 in 1958 and never looked back. Five guitars later (he presently owns a Martin D-28 and a Fender resonator guitar for slide blues), he has enjoyed playing privately and for small groups. Close friendships with talented guitarists have both improved his skills and enhanced his enjoyment of this “small orchestra” (Andrés Segovia).